Really impressed with this preview, looking forward to hopefully a veritable playground of magic in this book. 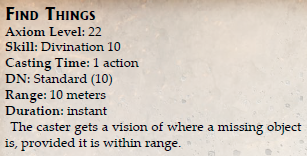 I’m thinking counterspells, spell duels, fun cantrips, the whole shebang. Also, more disfavored uses in future cosms? Yes, Disfavored will show up in future products. Nice work! Sounds like the spirit of the Aysle from Original Torg is alive and well! To be honest it was the hardest realm for my 90’s gamers to immerse themselves in. The ability for even non-natives to have access to things like cantrips will make it a major draw for players I suspect. Now I’m interested to see how the realm fleshes out in Torg Eternity. Questing as a function of reality (Preview #1) will definitely be helpful in getting players there! Who wouldn’t want to be the Once and Future King!!! I hope the “Birth Magic” from first edition is coming back in some form? Merged Principles and Mixed Forces, good decision. I’m hoping that Elemental and Enchanted will merge or be better defined. As well as adjusting spells that give Folk the abilities of avians/aquatics/etc, not being considered avian/etc. since they don’t affect that kindred. With the cantrips rules, I’ll echo that hope that Birth Magic will be a thing again. Seems like it would be as simple as advocating players to take one skill add of a magic skill in addition to one add of reality. We’re not really ready to give out any details yet, but no, there won’t be a system like the one in Original Torg. That was much too complicated.